In contrast to yesterday’s post, the sketch below is of a man who was very fidgety. His arms moved much more frequently than his body. The trouble I have with this kind of sketch is that I get mixed up. I use the visual cues of the lines I just drew to plan my next line. With the jumble of different positions, the visual feedback is muddled and confusing. 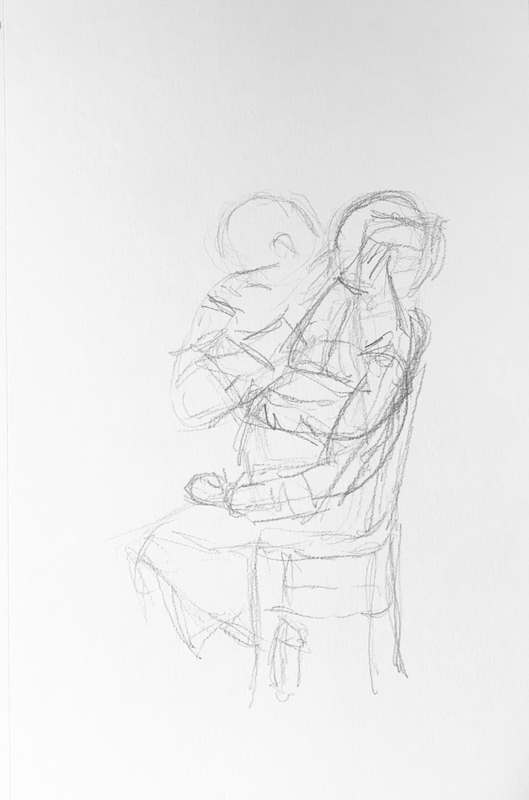 This entry was posted in Personal Stories and tagged 15 minute sketch, artistic process, creative process, creativity, fidgeting, gestures, pencil sketch, portrait, sketch, visual art. Bookmark the permalink. I like the way you handle these situations. The figure is an identity but the motion is also depicted. Thank you, Claudia. I used to be frustrated the the subject of one of my sketches moved or changed positions. Somewhere I saw an artist’s notebook with overdrawn limbs, trunks and even heads. I gave myself permission to do the same.